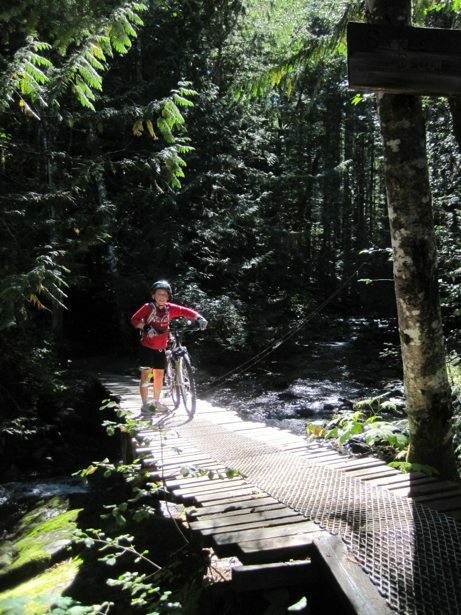 After another torrential coastal rain day, the forecast showed 2 sunny days so we got ourselves organized and hit the bike trails in Cumberland, which is written up as the “mecca” of mountain biking on Vancouver Island. Cumberland is an old mining town that is going through a re-birth of sorts thanks to the mountain biking and hiking trails that are being created in the area. 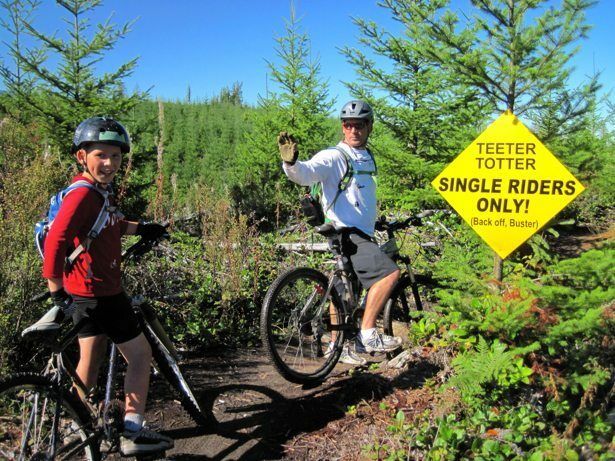 The Comox Valley Mountain Bike Club, United Riders of Cumberland and Dodge City Cycles are all good resources to check out prior to getting to Cumberland. Dodge City Cycles is the place to stop in town to pick up a map and local insights into the trails. The Cumberland trail network is built in the midst of logging and seems to have some variability to it, with trails coming and going as the logging occurs. The trails also seem to be built by a number of different trail builders, with varying standards and styles. The words “sketchy” and “old school” were said a fair bit as we biked through and over features. This was our first exposure to BC coastal trails and riding them the day after torrential rains meant that there was alot of mud, muck and slippery wet roots, which took some getting used to from our fairly sandy/rocky trail system in Whitehorse. The other challenge we experienced was the lack of signage. We have learned that we are really, really spoiled with the trails in Whitehorse – not just with the quality, but with the trail signage and the water proof topographic map! The Cumberland trails were not clearly signed and when you are riding up a logging road to access things, everything looks the same. After a few wrong turns and an extra 2.5km of riding, we got back to basic map reading skills and really really concentrated on everything that could give us clues. 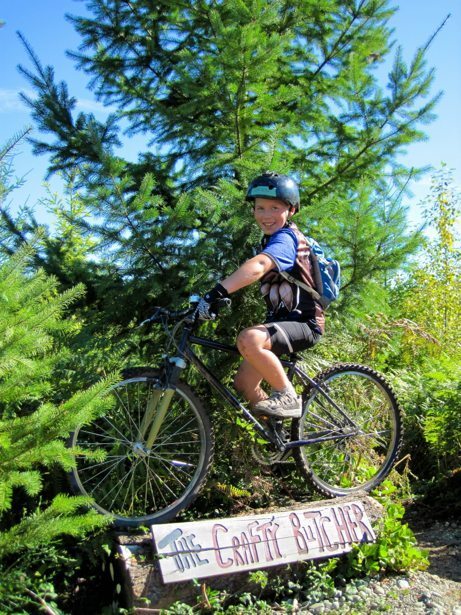 While Hunter loves the downhills, he is not a great fan of the steep uphill climbs that are required to get to the top of the mountain to experience the maximum downhill. Amidst questions like “are we going to the VERY top of the mountain? ?” and “you said we were almost there!! !”, he managed to persevere and make it 6km up to the top of the trail network. 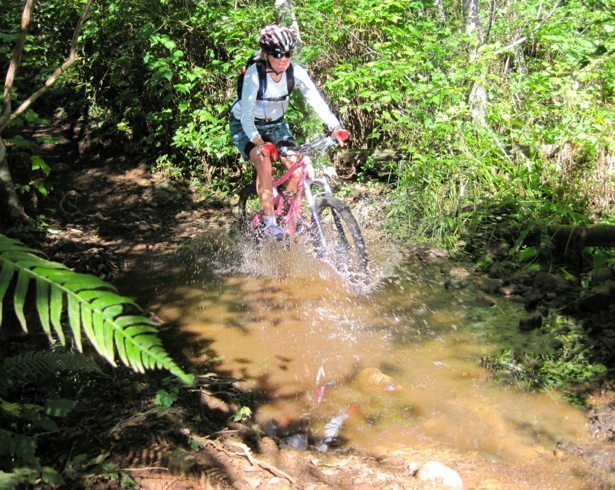 The reward was 8km of singletrack that wound it’s way back down the mountain through a variety of terrains and features. Trails we took day one were: Teapot, that damn trail, crafty butcher, black hole, and space nugget. Both days we rode the parking lot was at least 50% full with 10+ cars and this was in the middle of the day in the middle of the week. Everyone was incredibly friendly and helpful and most definitely passionate about the trail system here in Cumberland. 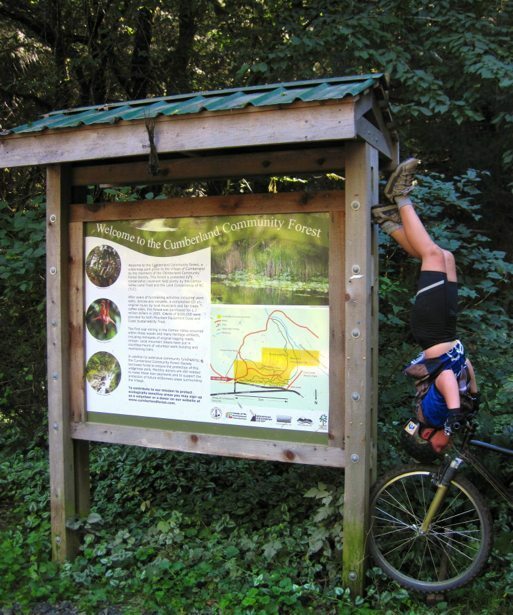 I can totally see how the riding experience would continue to improve as you had knowledge of the trails.